Maggie Madden uses sculpture and site specific installations to great effect, her reconstruction of found materials to create works that allude to drawing, painting and architecture have a very specific aesthetic and reference the natural world and our artificial environment. Madden is concerned with systems that occur in nature and are replicated in the highly advanced technological networks that we use in our everyday lives. The juxtaposition of organic with man-made materials highlights the contradictions and accentuates the similarities that exist between these systems. Madden draws attention to the constructed nature of our environs through her reworking of these found objects. The assemblages of materials in this exhibition are reworked in different manifestations, determined by the space where they are exhibited. Flow was previously exhibited in a different context where each singular base strip was suspended from an external wooden structure. For this exhibition the base strips were glued together and suspended from a height as one piece draping onto the floor. This piece has both a sculptural and painterly quality to it, the colours of the strips bleeding into each either creating an elegant flow. 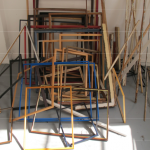 The title of the exhibition Site Line is taken from a work within the exhibition; a sculptural work fabricated from disused picture frames, which vary in both colour and scale. The picture frames draw attention to the architecture of the interior of the building creating a positive and negative space. The line created by the frames extend from the upper gallery to the window reaching the floor of the gallery space thereby creating a line drawing dividing the interior and imagining a virtual space. By shifting ones vantage point the visual convergence of the piece is lost and on your first encounter you are reluctant to step through it but as you do the piece re-emerges on the opposite side. Fred Sandback, a minimalist artist whose interventions in space using acrylic yarn coined the term ‘pedestrian space’, which for him was ‘literal and flatfooted and everyday’. The idea was to have the work present in a physical space without being raised on a pedestal. The term involved the idea of utility – that a sculpture was there to be engaged actively, and it had utopian glimmerings of art and life happily cohabiting.’ Madden interrupts the space with her work elaborating on this idea and of how we inhabit and negotiate space. It also reflects her background in fine art where the formal preoccupations of form and colour come into play. There is a recurring reference within Madden’s work to our constructed environment. The straight line and geometric aspect of her pieces could allude to the purist quality of modernist architecture and through her use of mass produced objects as source material she directly references our reliance on fabricated materials to create these structures. Her piece Expansion is constructed from fiber optic cable, which is primarily used to transmit communication over large distances creating a vast worldwide network echoing similar networks that exist in nature. Madden reduces the fiber optic cable back to very faint strands and delicately reconstitutes it as a series of cubes that could potentially perpetuate ad infinitum. Expansion has an imperceptible quality in that it appears and disappears depending on your viewpoint; drawing the viewer closer to the intricacies of the piece, Madden plays with the idea of what is seen and unseen. The scale of the works such as Expansion and Another Unit mimic architectural models often used by architects and reflect on architectural trends in urban design. Le Corbusier, a leading architect in the modernist movement, whose five points of architecture was to have a major influence on urban design was preoccupied with both creating a vertical city and how to deal with mass housing. He established his concept of the ‘dwelling’ as standardised, mass produced and serviceable, reflected in modern apartment complexes and high rises that have become the norm in cities all over the world. He did have a more utopian view in that he wanted to create communities within these environments, which included gardens and amenities for its inhabitants. Abandoning Corbusier’s utopian vision city planners adapted his ideas and used his model to maximize the use of space building vertical towers, which in some cases have become synonymous with modern day slums. Madden’s construction of Another Unit replicates this form of modern living and the uniformity of these apartment blocks. These spaces, while often referred too as units, have become the home environments to a vast majority of city dwellers. Both of these sculptures start from a point of density and expand into a more open space – this demonstrates Madden’s preoccupation with landscape and the conflict between the confines of an urban space to the openness and the visible horizons of the rural landscape. Guide consists of masons twine and wood, this found piece is a very basic tool in wall construction. The coloured twine would traditionally be used to map the layout of the wall and to ensure that it was constructed in a straight line. In this exhibition it is exhibited next to Coill Sáile, a piece of kelp that has aged and contorted over time. The metamorphosis of the man made materials in the exhibition create a stark contrast to the untreated natural elements that have been removed from their natural environments. It is this struggle of co-existence between these two worlds without the destruction of the other that is paramount to the future. Within our current contemporary living environments the development of mega cities and industry is encroaching upon our natural resources and ecosystems resulting in natural disasters that threaten our existence. The sustainability of our way of living is constantly being challenged. In ways, Madden’s work is about control, and questions the amount of control one can have over any given situation. Madden dictates the display and reconfiguration of the pieces but there is precariousness to the work manifest in the ephemeral nature of the materials and how they change over time. It is in that ‘letting go’ or recognition of where ideas can fall apart that the works exist thus leading to more possibilities. How to express the impossible and the futility of these endeavors are the poetics that inform Madden’s work and there is a certain comfort in knowing that even the everyday is unstable and capable of transformation. Mary Cremin is a curator based in Dublin. She works both independently and as project curator at the Irish Museum of Modern Art (IMMA).